What? W2s Aren’t Ready Yet? For QuickBooks users, the January task of creating W2s has only gotten easier over time. Assuming we haven’t been making errors in our paychecks over the course of the year, the creation of this year-end form is not difficult. 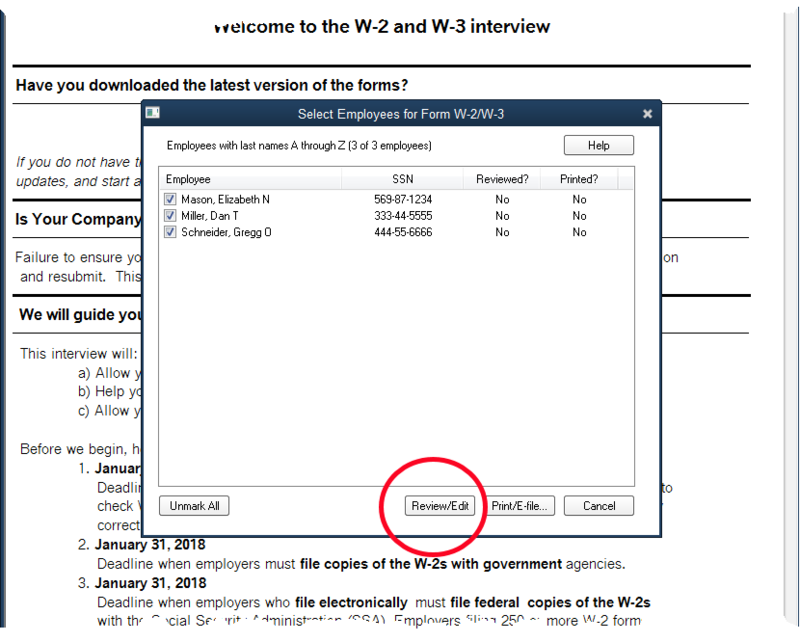 If you are an Enhanced payroll subscriber, you will find a list of forms in the File Forms section of the Payroll Center. You can see the circled item in the screenshot. This is the starting point for creating W2s. Don’t mistake this for the entry just below it, W2c. The “c” stands for corrected. Try to get the form right the first time as corrected payroll forms are always painful to do. Once we click the Create Form button (not shown in the graphic), QuickBooks presents you with a small window with two selections. One, it wants to know if you want to create W2s for all employees, or just some. We’re going to choose all, but this is handy if you need to go back and create one W2 for someone. Two, QuickBooks wants to know what year we want to create W2s for. Once we make those selections and continue, we get the following screen. We’re not ready to print. We’ll choose the option to Review/Edit. After a page of instruction, this is the next window requiring input from us. We’ve highlighted three selections in the above screenshot. Kind of Payer is selected as 941. This is the most common. 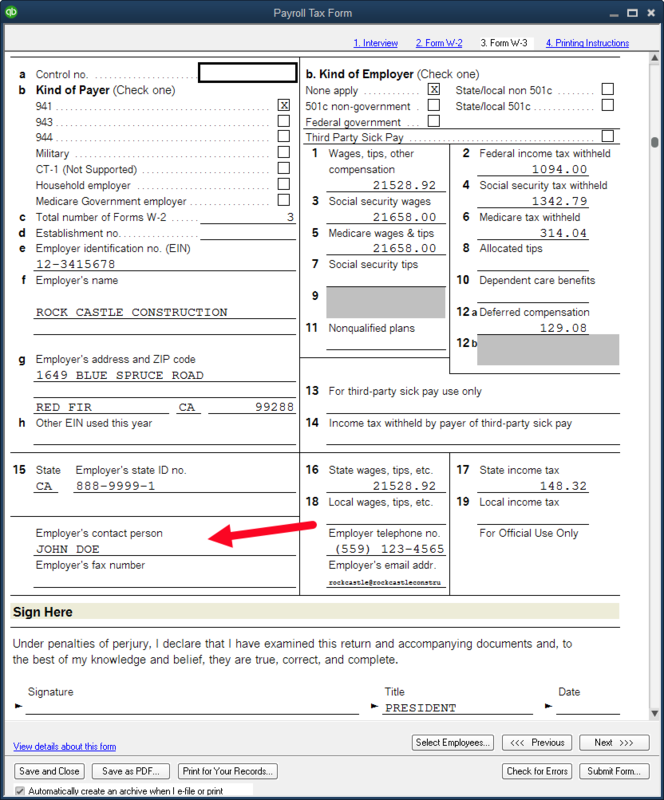 This is the IRS payroll form you are required to file, reporting wages and federal taxes withheld from paychecks and deposited to the government. The second most common selection here is 943. That is the 941 replacement form specifically for agricultural employers. Kind of Employer is also the selection most businesses will make. Rock Castle is neither a government agency nor a 501c non-profit organization, so this is the correct selection for them. Read the Special Situations section carefully. In Rock Castle’s case, they do have a retirement plan for their employees, so they must answer Yes in this section. For the next several screens QuickBooks allows you to review the information entered on each W2. This is for review only. There shouldn’t be anything to change or enter. If there were, it probably means there was an error in payroll setup at some point during the year. The last of those review screens is shown below. It is the W3, a summary of all the W2s that will be submitted. 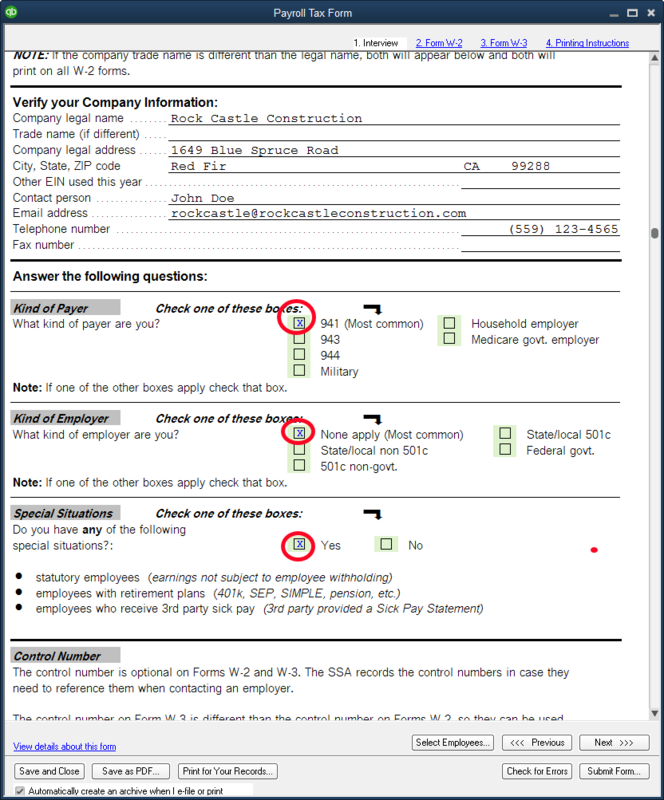 Again, there should be little to add or change on this form as QuickBooks pulls the information from the payrolls that have been processed over the course of the year. Be sure there is a name in the field for Contact Person. Once we click the Print button, the following window gives us our final selections. One of the things we like best about the QuickBooks process is printing on plain paper. Three print runs will be required, one each for employees, a copy for the employer, and a copy to submit to SSA. 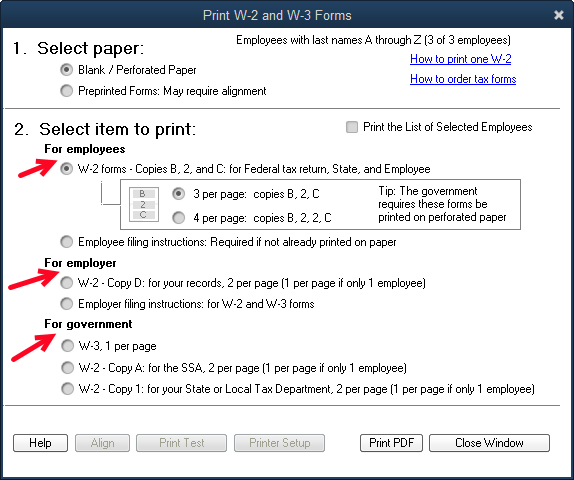 Starting at the bottom, we can print the W2s and a W3 on the plain white paper that likely is already loaded in our printer. Once that print run is complete, we can print a copy to file for ourselves. An alternative to actual printing this file copy would be to save a pdf copy. You will have that option as you proceed to print. It saves a lot of file space if we save to a folder on our computer. The top selection is for employees. The two choices are 3 to a page or four to a page. Each of these choices prints in a different format. You are free to print multiple times, so if you’re unsure, print some and see which format you like. This copy is an exception to the no form needed idea. While they will print fine on plain white paper, the government does require employee copies to be printed on perforated paper that will tear off into either 3-part or 4-part forms. Most office supply stores should carry this special paper. There it is. You’ve created your own W2s and it wasn’t even hard.